We have teamed up with Minnetonka to bring you two DIYs with our favorite pair of Minnetonka boots! You can see Casey's DIY here and you can see Savannah's DIY here. 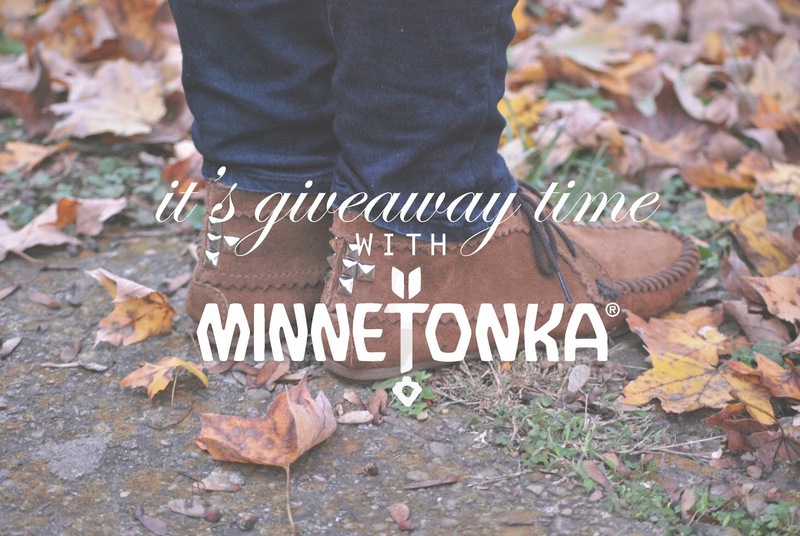 And after you've checked out both of our posts over on Minnetonka's blog, you can enter to win either pair of our boots for yourself! There are many ways to enter but you must leave a comment saying which pair you'd want. Additional entries include liking us on Facebook, liking Minnetonka on Facebook, following us on twitter and tweeting about this giveaway. The giveaway will last until Tuesday, November 19 at midnight (central) and is only open to U.S. residents! Good luck! i would LOVE pair of Minnetonka tall boots or even booties! it doesn't matter, they're all so cute!! I LOVE the tall boots- so cute! CALF HI 2-LAYER FRINGE BOOT in grey! So I can match my friends 6 month old:) Just gifted her a pair of booties. Ooo...the Classic Fringe boot with the hard sole! I'm desperately in love with the Front Laced Knee-High Boot. So gorgeous! The double fringe tramper please oh please!!! Love love love Minnetonka Mocs! I can't decide between the black lace up fringe ankle wedge boot and the suede ankle boot in dusty brown....I'd be so happy with either! Love Savannah's fringe booties! So perfect for fall! I love the men's moosehide! Totally fantastic shoes. The classic fringe are great, I love the pattern on the tongue. they are all soooo cute, I think I would want Savannah's DIY though <3 you guys are amazing!!!!!!! I would love to have the Minnetonka Classic Fringe Boots, they are too cute! i love the classic fringe. so cute and you can wear it with so much. I love the tall boots with fringe. So cute! LOVEE the fringe boots! So.darn.cute. I love the Classic Fringe Hardsole boot! They are so cute and look like you could wear them with almost anything! any pair of short ones! so cute! I love the studs on Casey's!! They are both so cute! I would rock the studs for sure! The studded suede ankle boots are beautiful. I like the fringe boots! I Love the studded ankle moccasin boots they are so cute!!! I like the two button boot! Very cute! I love their studded moccasins! I love both! I'd happily take either one. Great job!! Those classic fringe boots are ADORABLE! I would love the classic fringe boots! So functional, versatile, and most importantly adorable :) And I love the DIY for them! I like the DOUBLE STUDDED MOC. Oh, I'd love a pair of classic fringe boots! Both are great, but Savannah's are a little more my style. Love them! I've been rocking the Thunderbird for ages, but I'd loooove some little booties. My current favorites have to be the Classic Fringe Boot. AH! I love your blog! I just recent;y found you all through a pin on pinterest. totally addicted. Readying every post. =) And I LOOOOVE Savannah's cute booties! I love all minnetonkas, but I love the ones by Casey! I love the Classic Fringe Bootie! Especially with Savannah's DIY addition. SO CUTE! I like the pair with the fringe on them. More importantly, my mother loves Native American style, and her leg brace would fit in it. I would want either, they are so cute! Would love a pair of short ones, they are really cool looking. Would love the embroidered pair! So adorable! Id love the suede ankle boots! So cute with the studs! Definitely the pair with the fringe! Love! I'd love the CALF HI 3-LAYER FRINGE BOOT! So cute! I love the EL Paso ankle boots!! Why pick just one? Combine the studs with the fabric tongue! I am in LOVE with the double fringe side zip boot in grey! So cute! They look like they would go well with dresses, skinny jeans, skirts, bootcut jeans. You name it, I would wear it with them! I love any Minnetonka show, particularly the mocs, but I would love to have a pair of ankle boots like these.